So, it's time I got around to my sewing room. It's gotten so deep that I have to shuffle my feet to make sure I don't step on something of importance. But then I risk getting a pin or needle stuck in my big toe. Guess it's about time to shovel it out. Don't get me wrong....I still know where everything is. Well, most of the time anyway. 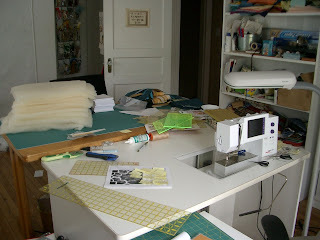 I keep telling myself I thrive on 'visual stimulation', but there comes a point, and I think my studio is there already. 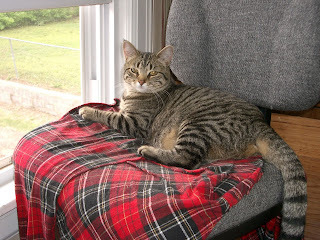 Sally the Kitten (now Cat) has finally established her territory and it is the high drafting chair that I use when I have to spend hours at the ironing board. I use it instead of standing all day, but now she has found that it is the perfect height for looking out the Sewing Room window at all the birds and squirrels that entertain her. So the chair has to stay in its position now by the window. Then there's all the in-process class samples that are in piles on my cutting table. Until I get them finished, packaged and labeled for shipping, they have to stay in their position, or I'll lose track of them. Then there's all the hand-dyed fabrics in the closet. Until I have time to cut them into Fat Quarters and bundle them into packets for sale, they'll have to stay in their place, too. So what's left? Not much. I could sort through all my sewing machine feet and accessories and organize them in my fishing tackle boxes. Then there's all my thread. I should put them back in some semblance of order in my thread storage cases and then stow them in the cabinet. Oh, there's so many more things I could be doing that would be so much more fun. A few years ago, my son Kelly made a sign for my sewing room door on his computer. 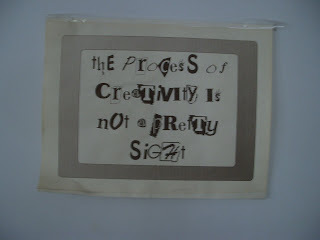 It says in DingBats "Creativity is NOT a pretty sight". Maybe I'll just shut the door and let that sign say it all, and wait for another day. I think I'll go outside to play. 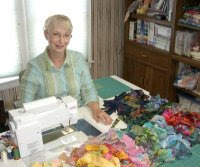 I too have recently worked on my quilting room. I need to find a better way to organize my materials. Yup, and that's what you do! 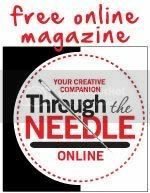 My problem is that I am too busy getting ready for my 3-week road trip and new book edits that I can't start the new projects that are in my sketch book and in my head! Love it when I have enough time at home to get to what I WANT to do! 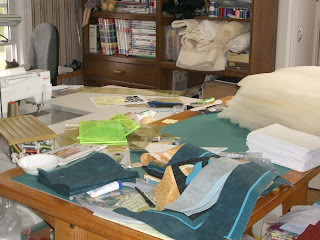 This year I decided to clear up my sewing room and complete all previous projects. The problem is other inspiration comes along and you have to run with it. The best helpers I have are a magnet to find lost pins, NOT kept next to my machine though. Strips of left over edges of batting/wadding to clean up my cutting board and a stiff kitchen broom to keep the dropped pieces of threads under some control. When you have time to yourself - you should be creative not cleaning!!! !